WILLEMSTAD – The Results are in. MAN is the biggest party of the island with 12,822 votes, which is good for 4 seats in parliament. Second party is MFK with 12,676 votes, which is also good for 4 seats. PAR came in third with 11,945, which is good for 4 seats. The new party Korsou di Nos Tur (KdNT) with the controversial leader Amparo dos Santos came out of the elections as one of the surprises with 4822, which is good for 3 seats in parliament. The current ruling party Pueblo Soberano received 5293 votes and will have 2 representatives in parliament. PNP came out of the elections with 6922 that gives them 2 seats in parliament. Other parties that received representation in parliament are Un Korsou Hustu of the Independent MP Omayra Leeflang, 1 seat and Movementu Progresivo headed by the Independent MP Dr. Marilyn Mozes also received 1 seat in parliament. The biggest loser is the current coalition party PAIS that came out of the elections with only 3651, which is not enough for a seat in parliament. The party went from 4 seats to no representation in parliament. 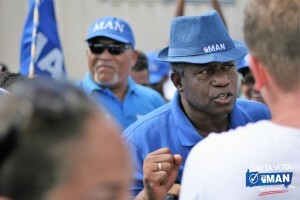 The party of the former leader of the MAN, Charles Cooper also came out without representation in parliament.